Systems of equations can be challenging for Algebra 1 students! The first day of my solving systems by substitution lesson, I see so many heads explode. I've developed some favorite ideas and resources over the years that I'd love to share with you! 1 - Emoji Logic Puzzles - These logic puzzles are a fun way to get students solving systems without even realizing it! They would also be fun warmups or as emergency sub plans during this unit. 2 - Solving Systems of Equations by Graphing Pennant - Solving systems by graphing is the best place to start the unit. It helps students visualize solving algebraically and starts in their comfort zone. 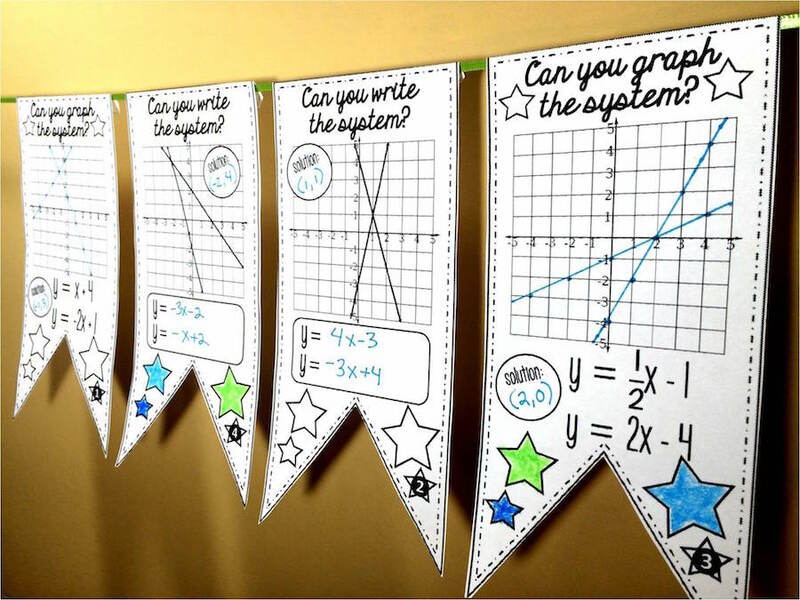 This pennant is a fun way for students to practice! 4 - Systems of Equations Sum 'Em Activity: Word Problems - You better believe that I'm going to use a sum 'em to help students figure out systems of equations word problems! Sum 'em activities get students working together and discussing math. They are so easy to use, but keep students persistent and engaged the entire class period. 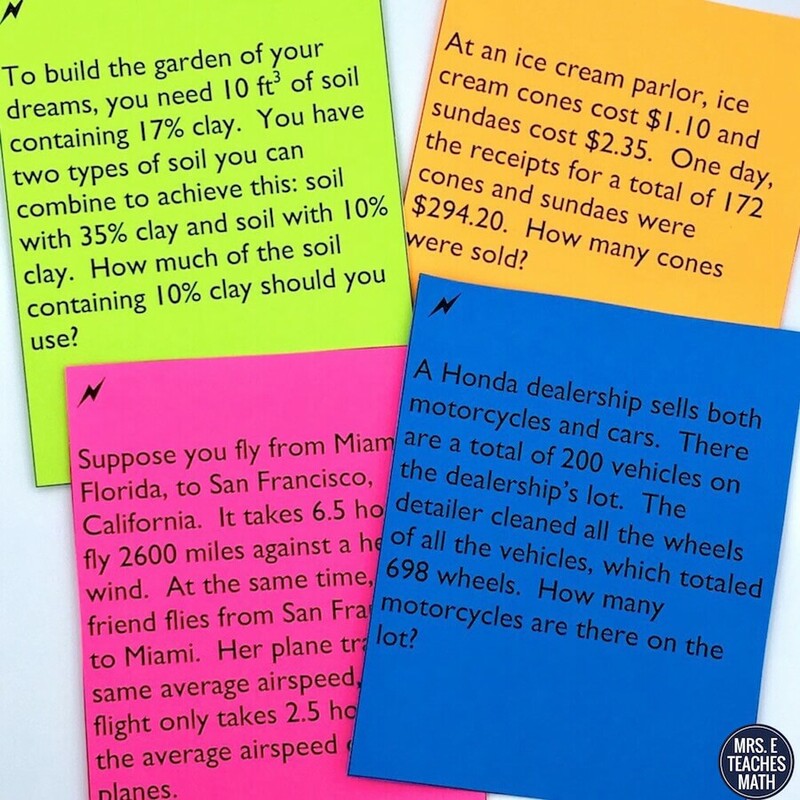 Word problems can be so difficult, so I absolutely use this activity to help students master them! 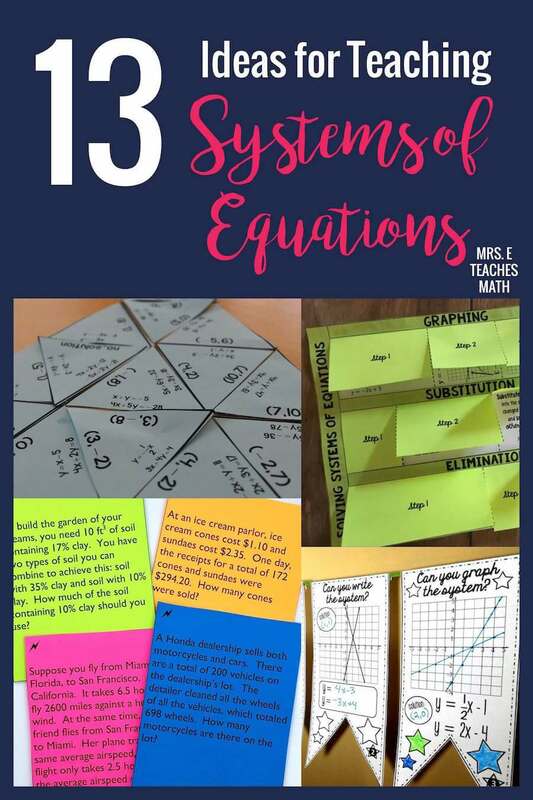 5 - Linear Systems Interactive Notebook Unit - If you want an entire interactive notebook unit for systems of equations, look no further. This complete unit is ready to copy! 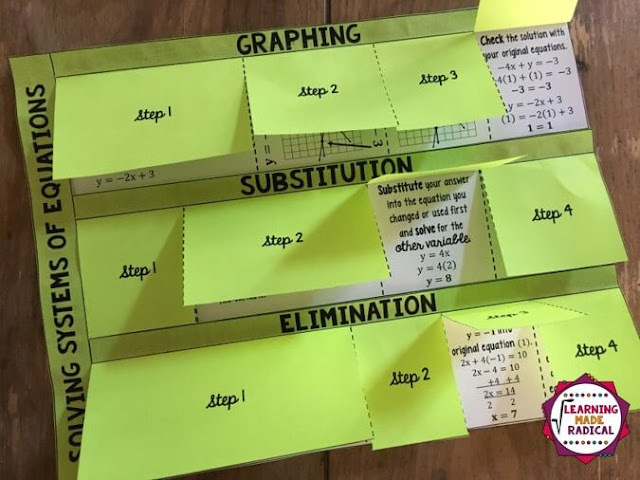 6 - Solving Systems of Equations Interactive Notes Activity - This set of notes is ready to go in an interactive notebook. I like that it compares the different methods for solving systems and keeps the information organized in one place. 7 - Systems of Equations INB Pages - These are the interactive notebook pages that I used last year! The notes pages are a FREE download. 8 - Have Students Highlight the Variables - When teaching solving systems by elimination, have students "stack" the like terms and highlight them like the picture below. My students struggle when the variables aren't lined up and this helps them remember to add and subtract the like terms. 9 - Systems of Equations Matching Game and Quiz - This FREE download is a fun matching game to give students practice solving systems. Also, the quiz that's included could be used as an exit ticket or as an additional INB page. So many uses! 10 - How Can You Win Every Prize at Chuck E. Cheese's? 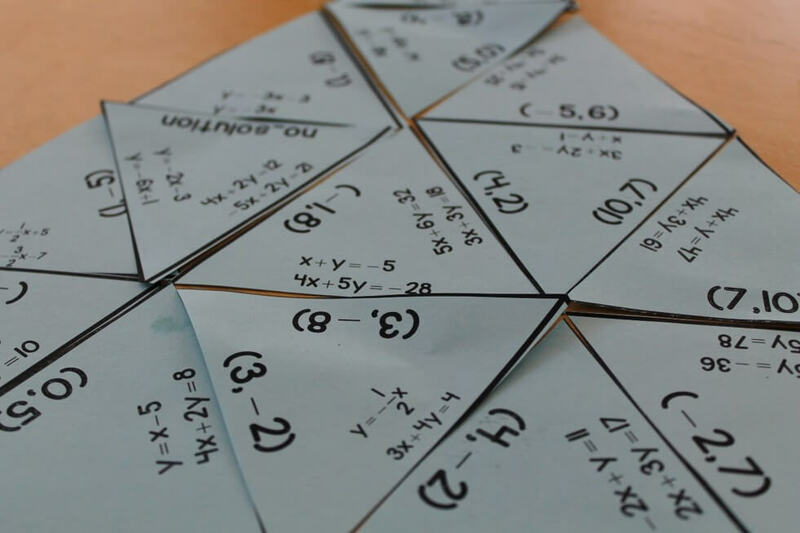 - This is a cool 3-act task that keeps students interest while introducing them to the topic. To be successful, students need to be very comfortable graphing equations of lines. Also, this would be a good introduction to systems of equations word problems. 11 - Solving Systems of Equations Puzzle - This hands-on puzzle gets students practicing elimination and substitution. Since this is self-checking, students don't practice incorrectly - they must ask for help if they don't find their answer. 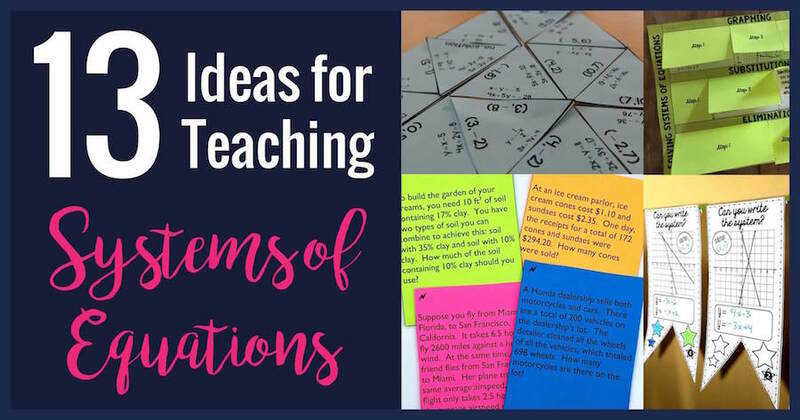 12 - Systems of Two Equations Task Cards - Sometimes you just need a good set of task cards. This set of task cards is perfect for warmups or playing speed dating. You can find some great ideas for using task cards here and here. 13 - Systems of Equations Word Problems Stations Maze - Students need LOTS of practice with word problems! This stations maze gets students out of their seats and moving. It also encourages students to check their work carefully since an incorrect answer will eventually send them back to a problem they have already solved. Successfully completing the stations maze requires students to slow down and check their work. I hope you have found something useful to use in your classroom this year! The rules for exponential operations and its inverse, the log functions.